Not everyone on your soccer team will have the same amount of skill and experience. Many players start locally at age three or four and by the time they are on U8 teams, most have at least a couple years experience. For recreational soccer, players simply sign up, there are usually no tryouts for the team. For competitive soccer, there are tryouts, so players making the team have at least basic skills and have the potential for advancing quickly with strategy. Recreational soccer may have two or three of the eleven players who have never played before save kicking the ball around in their yard. These players tend to be good listeners, wanting to boost their skill levels to match their teammates, but tend to hold back until they feel comfortable with the rules of the game and being coached. Don’t categorize your players: novice players here, experienced players over there…keep them together, surrounding the weaker players with better players. All players need to play all positions regardless of skill level. 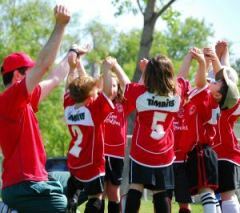 This builds confidence among all the team players, creates a positive atmosphere and good sportsmanship. Those players with a bit more experience tend to be more aggressive, run faster, kick harder, using more strategy. Utilize those players often and let the novice players watch as much as they play in the beginning. In a few games, they will be running and kicking with more power and with better control. Keep the practices fast and controlled. Every player’s skill level will increase week to week, don’t hold back teaching the players how to work with each other, to kick, pass, receive, throw in, and touch control. Strategy comes with experience. Competitive soccer works much in the same way. Every team will have stronger and weaker players. By surrounding even experienced soccer players with stronger players, this will bring out the best in all the players.